Communication is Daniel Smrokowski’s biggest passion, but it’s also his biggest struggle. 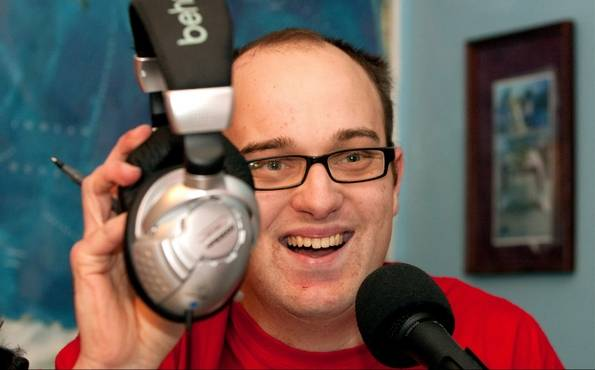 The 25-year-old Westmont man is the founder and executive director of Special Chronicles, which produces podcasts, news and opinion pieces featuring the voices of people with special needs. Daniel does all this with an insider’s perspective, because he has a learning disability and a speech disorder. “I struggle expressing myself. It may be hard for people to believe because of what I do,” he said. His words come slowly, sometimes with a stutter. At times, when he’s excited, they seem to rush out of him. “It’s hard getting the words out. If it’s a hard word to say, I have to think of another word to say instead. But even that is a struggle, because it’s really hard for me to process information,” he said. Special Chronicles has grown from the occasional podcast in late 2008 to a weekly podcast featuring people with disabilities, their friends, their families and anyone with connections to the special-needs community. 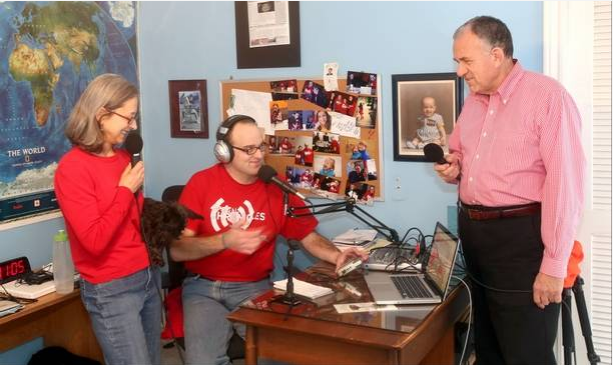 “Our mission is giving respect and a voice to people with special needs,” Daniel said. 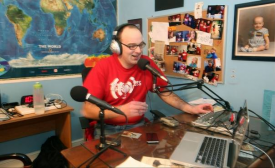 The podcast — which has listeners in more than 80 countries and attracted more than 300 unique listeners in January — was nominated for the 2012 About.com Reader’s Choice Awards and the 2011 Catholic New Media awards, Daniel said. Daniel, a 2012 Roosevelt University graduate who majored in journalism, was a recipient of the Les H. Brownlee Scholarship from the Chicago Headline Club. Over the years, Daniel has interviewed more than 65 people from as far away as Australia, the Philippines and Singapore. Among his favorite interviews was Tim Shriver Jr., the grandson of Special Olympics founder Eunice Kennedy Shriver. “I just like to tell our stories. It feels inspiring to talk to a lot of people and to hear their stories,” he said. It’s especially poignant to tell such stories without video, using only audio and photos, Daniel said. “People can focus on our abilities of what we can do, so people can really hear our voices,” he explained. Graduating college was no easy feat for Daniel, who’s the true exemplification of perseverance, said Nancy Litke, senior director of the Academic Success Center at Roosevelt University. The school honored Daniel with the Matthew Freeman Award for Social Justice in spring 2012 for his efforts in promoting awareness of disabilities. Daniel was always eager to use any resource available to him, which was among the keys to his success, Litke said. “It’s really never about how significant the disability is, it’s how motivated they are, the fire in their belly,” she said. Daniel was born prematurely at less than 25 weeks, and a lack of oxygen to his brain likely caused his disabilities, said his father, Adam Smrokowski. “His brain takes a few extra seconds to process things,” he said. His parents instilled the importance of perseverance in Daniel. “ ‘I don’t care what the world has to offer, or what challenges you have, you don’t give up.’ That’s what we always told him,” Adam Smrokowski said. They also encouraged Daniel — just as they did his younger sisters — to get involved in sports, but it was hard for him perform alongside, and be accepted by, his peers. That all changed around age 14, when someone recommended he join the local Special Olympics chapter, the Southeast Association for Special Parks and Recreation. “With an even playing field he just blossomed. He realized he can do all these things,” his father said. Daniel has competed in swimming and basketball; this spring, he wants to try his hand at softball. “It doesn’t matter if we win or lose. All that matters is that we try our best and that we have fun,” Daniel said. His pride in Special Olympics is palpable. “The Special Olympics USA Games in June 2014 is bigger than the Super Bowl. We have lots more athletes. We have a lot more medals than Michael Phelps or the other Olympians,” he said. 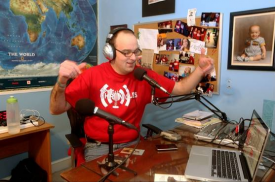 Daniel is among 100 or so athletes who have become Global Messengers for Special Olympics after taking part in a leadership program, said Barbara DiGuido, director of communications and media relations for Special Olympics Illinois. In the last five years, Daniel has given more than 20 speeches, including those to students in Arlington Heights, the Elmhurst Police Department and the Westmont Rotary Club. Daniel’s contribution to the special-needs community has been priceless, she added. This week, Daniel is at the Special Olympics Illinois Winter Games in Galena, where he is recording audio for podcasts and interviewing local athletes as a freelancer for the Bugle newspaper in the Western suburbs. When Daniel started attending Westmont High School, his special education team had put together a plan for him to find work after graduation, his father said. But Daniel was always adamant he wanted to go to college. High school was especially hard, he said. Daniel said he now understands his disability better than ever. His Catholic faith is also an important part of his life, he added. Special Chronicles has filed to secure federal nonprofit status, with the goal of turning it into a self-sustaining new media organization with funding through grants and donations, said Adam Smrokowski, who serves as a board member for the enterprise. “We want to develop other things we can do to help people with special needs,” he said. Special Chronicles is truly his life’s mission, Daniel said. Who inspires you? Father Roderick Vonhögen, who created The Catholic Insider podcast, my mom, my dad and my younger sisters. What’s on your iPod? A lot of Christian and Catholic music. What book are you reading? I just finished “Fame” by Karen Kingsbury. The three words that best describe you? Athlete. Communicator. Techie.